3D Gallery Connect is a Smart TV application that provides access to 3DMedia's 3D Gallery and you to enjoy amazing 3D photos. 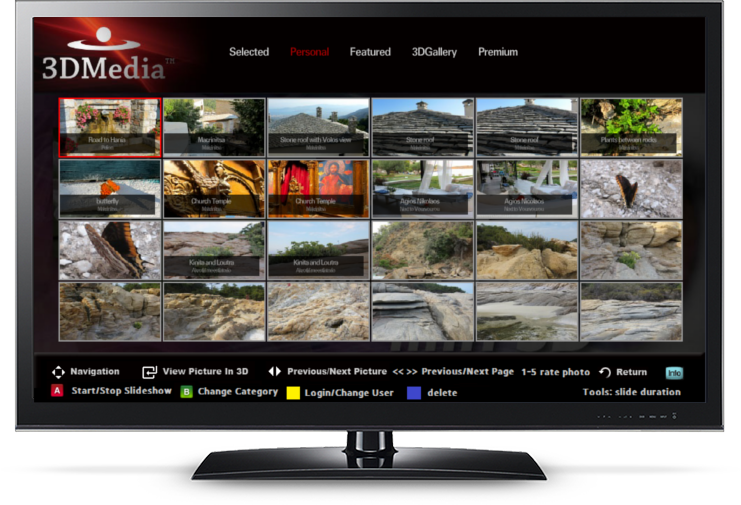 3D Gallery Connect is part of 3DMedia’s product line that allows users to easily capture, share, and enjoy their personal 3D content. 3D Gallery Connect is an application that runs on Smart 3D HDTVs and allows users to connect to 3DMedia’s 3D Gallery (3dmedia.com/gallery or 3dmediagallery.com). 3D Gallery Connect provides access to your personal content, content of thousands of other users around the world, as well as captivating, high-quality 3D photos captured by professional photographers. The 3D Gallery Connect is part of 3DMedia’s 3D ecosystem that allows users to easily capture, create, and enjoy high-quality 3D photos. This ecosystem consists of smartphone applications that allow users to capture and create 3D photos, PC tools that allow users to create 3D photos using their existing cameras, professional tools that allow 3D photographers and enthusiasts to adjust and optimize the quality of their 3D photos, the 3D Gallery where users and professionals can share their content, and finally Smart TV applications that allow users to connect to the 3D gallery and enjoy the 3D photos there. Users can access different content in the gallery based on their level of service. Free users can enjoy a limited number of selected photos. Users with purchased services can access their personal 3D photos, as well as featured and premium content. The 3D Gallery Connect application supports very limited management of your 3D Photos (e.g., deletion of photos/albums). 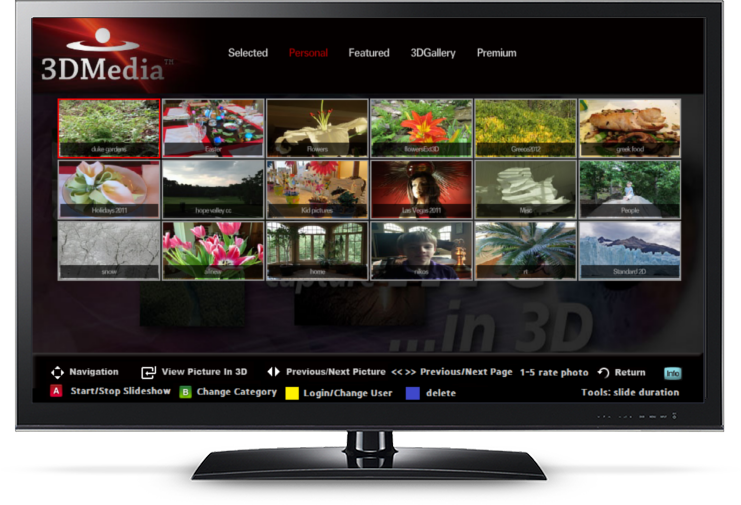 Full content management is done by accessing the 3D Gallery using any web browser. The user interface of the 3D Gallery Connect application consists of different categories and views. Each category has an album or a photo thumbnail view. Album view is a collection of albums. Photo thumbnail view is a collection of photos for the selected album or category. Photo view displays a 3D photo in full screen resolution and navigation can be done manually (standard photo view) or in slideshow mode. You can navigate to the desired category by pressing the Green (B) button on the TV remote control. Once you are in a category, you can browse the albums and photos in that category. Once a you select a photo, the display changes to 3D mode and shows the selected photo and the remaining ones in 3D. You can navigate using the left and right arrow keys. This is the standard photo view mode. You can also start a slideshow of the selected album by pressing the Red (A) button while in thumbnail photo view. In this mode, 3D photos are shown in sequence without pressing any buttons. You can login to the 3D Gallery by pressing the yellow (C) button and by supplying the same username and password you used to create your account in 3dmedia.com, or the same one you used to create an account using the Trimago smartphone application. Once you have successfully logged into the 3D Gallery, you do not have to retype your login information again after exiting and re-entering the app. · Green (B) Button: Change category (i.e., Selected, Personal, Featured, 3G Gallery, Premium). Photos can be deleted when you are in photo thumbnail view or in regular photo view by pressing the Blue (D) button on the remote control. Photos cannot be deleted during slideshow. Albums can be deleted during album view. A confirmation window will be presented before a 3D photo is deleted. You can delete only your own photos. Deletion of photos and albums cannot be undone. 3D photos can be rated by pressing the 1-5 buttons on the remote control during regular photo view. When you rate a photo, the new total rating is shown along with your rating. You cannot change the rating of your photos or the 3D photos that you have already rated. 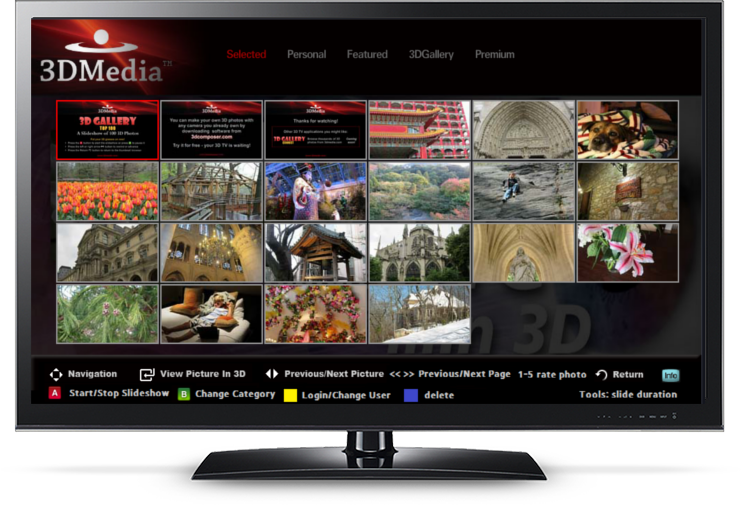 In addition, 3D photos supplied by 3DMedia (i.e., Selected, Featured, and Premium) cannot be rated. 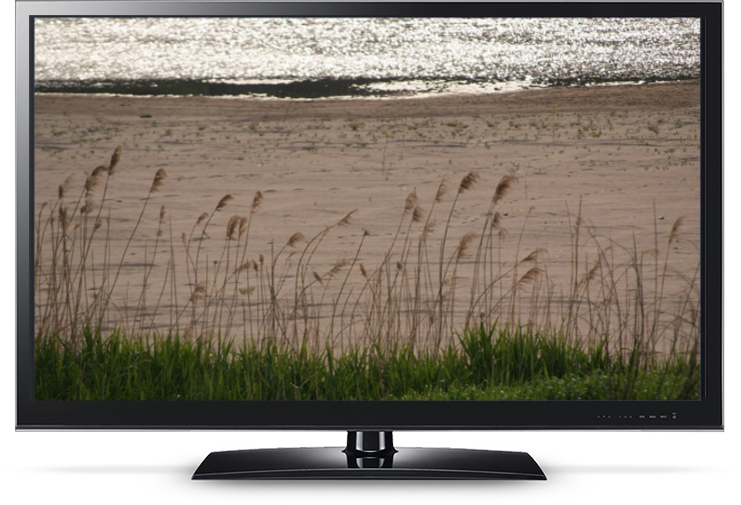 You can start or stop the 3D slideshow using the Red (A) button in the remote control. You can control the duration of a 3D photo in slideshow by pressing the "Tools" button. You can then navigate to the desired interval using the left/right navigation buttons and select the desired slideshow interval. When you upload photos to the 3D Gallery using Trimago or any Internet browser you can press the PLAY button to refresh your current album with your new 3D photos. If you are in slideshow mode and you press the PLAY button, the slideshow will restart from the most recently uploaded photos.